Time Carnage for Nintendo Switch is what happens when you take a VR FPS that was already pretty pedestrian and remove the only thing that made it interesting in the first place – VR. First things first: the gameplay. This is quite possibly the most basic first-person shooter the Switch has seen yet. Upon starting a level, you’ll quickly discover that you can only move about 2 feet in any direction on a circular platform – a vestige of the game’s VR roots. Not that it matters since you won’t need to move much to dispose of the game’s lifeless enemies. From zombies to mutated dogs to dinos to killer robots, every single one of them simply runs at you until you pump them with enough lead. Should they manage to reach your location (which is quite likely given how easily they tend to blend into the background) they’ll gently whack away at the force field surrounding your platform until it breaks, at which point it’s game over. It’s not even satisfying to shoot at these ugly mooks since the gunplay is so bad. There are a variety of weapons to unlock, but none of them are particularly satisfying to use thanks to the weak visual feedback and limp sound effects. Perhaps worst of all is the game’s nonsensical reload system, which forces you to drop your weapon with the L and R buttons when they run out of ammo and use your backup gun while you wait for it to reload. What was wrong with the classic method of simply putting more ammo into your gun? This is not a wheel that needed to be reinvented, and the issues don’t stop there. The biggest problem with Time Carnage is the controls. The traditional option of using the analog sticks to aim feels absolutely horrible and imprecise no matter what the sensitivity is set to, which leaves only the gyro controls to help me line up my shots. Sadly, I have never been and never will be fully comfortable with gyro controls. Although this game is a little better than Splatoon in that it lets me use the sticks to aim broadly in all directions (not just the X-axis) while using gyro to make adjustments here and there, I still cannot completely wrap my head around it which leads to me missing quite a few of my shots. There is a third option; however, it comes with caveats. The co-op feature allows you to pass a Joy-Con to another player and lets you each control a gun, similar to light gun arcade games. Given that this is gyro control and not true motion control, you’ll sometimes be forced to press the Y button to recalibrate your aim to the center of the screen, but all things considered this pointer control method actually works quite well and I wouldn’t mind seeing more games of the genre ported the Switch (House of the Dead, anyone?). There’s just one problem – this is a co-op mode, which is great if you have two players, but successfully attempting to control both guns solo by dual wielding the Joy-Con is basically impossible once the difficulty ramps up, and there’s no option to use just one Joy-Con with gyro control on your own. This all added up to make the game very difficult for me to actually play unless a second player was present. There’s not much else to say about Time Carnage. There’s a wealth of content to unlock and play including an arcade mode where you can equip various perks and a challenge mode where you attempt to get high scores in various scenarios, but the core gameplay is so unexciting that I can’t imagine anyone wanting to bother as each level’s five waves just feel like a complete and utter slog to get through. The visuals are drab and unexciting, and here’s where I’d usually say something about the game’s music but it’s so forgettable I honestly can’t remember if it even has any. The sad thing is that I can see the game actually being somewhat enjoyable on a VR system. While Time Carnage’s grotesque creatures aren’t very thrilling on a TV, they’d be a lot more intimidating when viewed in 3D through a headset, and the abysmal controls would be vastly more playable with actual motion controllers. If you’re really interested in the game, I highly recommend checking it out on any platform other than Switch. 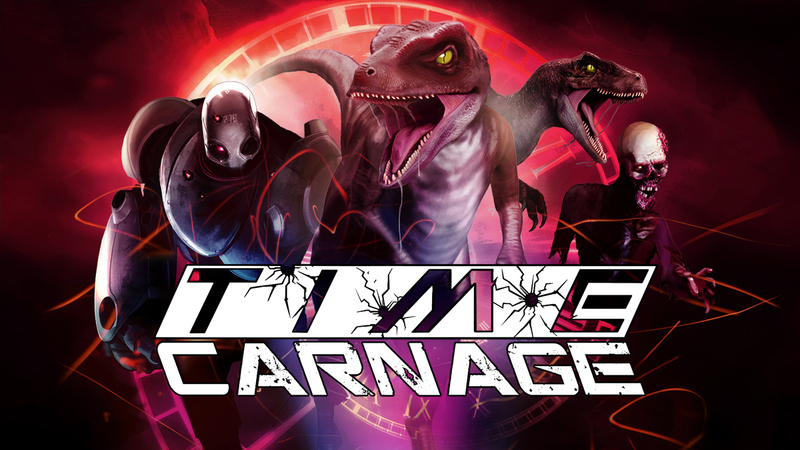 Time Carnage is very clearly a game designed from the ground up for VR and has no business being on the Switch. If you’re desperate for a gyro-controlled shooting gallery or have a co-op buddy to play with then you may find something to enjoy here, but everyone else is better off sticking with the multitude of other shooters currently available.